An ephemeris is a table of positions and related information, quite boring to look at but sometimes quite informative. There are no big surprises here. Just type in the Date at the top, specify the interval you want calculations for and press calculate. Widen the screen or scroll the horizontal scroll bar to get all of the columns. De refers to the Jovicentric Declination of the Earth. Sep is the approximate angular separation between the Sun and Jupiter in the sky. RA stands for Right Ascension. The Mag Lat column is the magnetic latitude facing Earth. This number varies because the magnetic poles differ from the rotational poles of Jupiter by about 10 degrees. Io SGC here is identical to Io Phase. It relates the position of Io in its orbit around Jupiter to the Superior Geocentric Conjunction, that is the point in the orbit where Io is directly opposite to the Earth, ( Jupiter lies in a straight line between Io and the Earth). 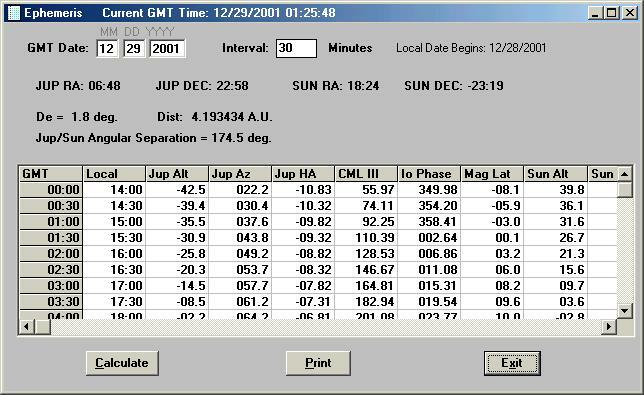 CML III is central meridian longitude of Jupiter. The III is here to simply emphasize that this is the System III longitude as specified by the International Astronomical Union convention. Jup HA and Sun HA refer to the Hour Angles of these objects. In this program we define Hour Angle as the number of decimal hours before (minus) or after (positive values) the local meridian. Hour Angle is not always defined in this way in other books and programs, but this is the most useful way it can be used, in my opinion.